You may have noticed, but we’ve been eating a lot of cupcakes this winter. Okay, we eat a lot of cupcakes all the time…but there is something about the winter and wanting rich comfort foods, versus light and refreshing flavors in the spring and summer. We’ve already reviewed a lot of winter flavors for you, like Chocolate Peppermint from La Cakerie and Sweet Hearts Patisserie, Eggnog from Vanilla Pastry Studio and PamCakes, Apple Cinnamon from Dessert Affairs, and we can’t forget the seasonal minis Crusader Stacy tried from Disney’s Epcot. Aside from all these cupcakes we’ve consumed throughout winter, we’ve neglected to share with you some of the other new flavors we’ve tried from the bakeries we visit (very) frequently. 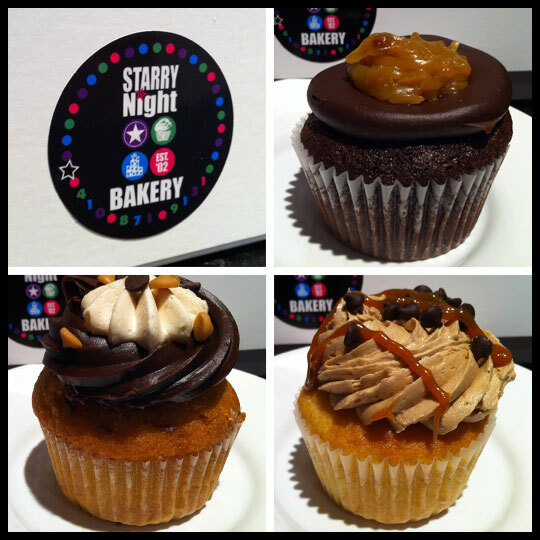 Some are more seasonal flavors, others are flavors to satisfy you on a cold night. All were delicious. 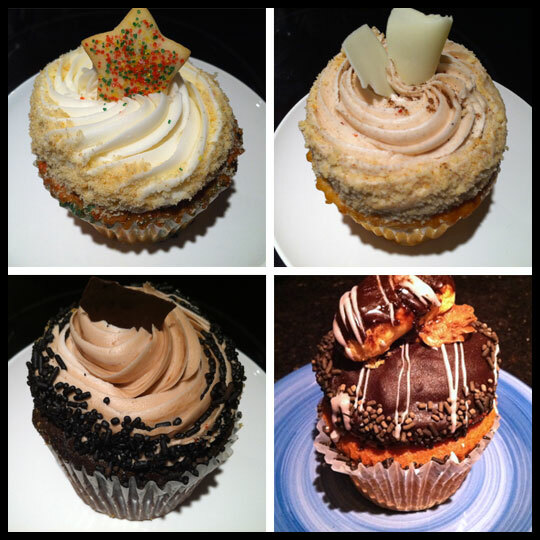 This year, Kupcakes & Co. had the same seasonal flavors as last winter. While we had our share of those again this year, I was also able to try a new flavor: Cinnabon. With their rotating menu and huge flavor selection, you might see flavors you haven’t tried before depending on the day you stop in. I really loved the Cinnabon cupcake, but I’m a sucker for a good spiced cake. 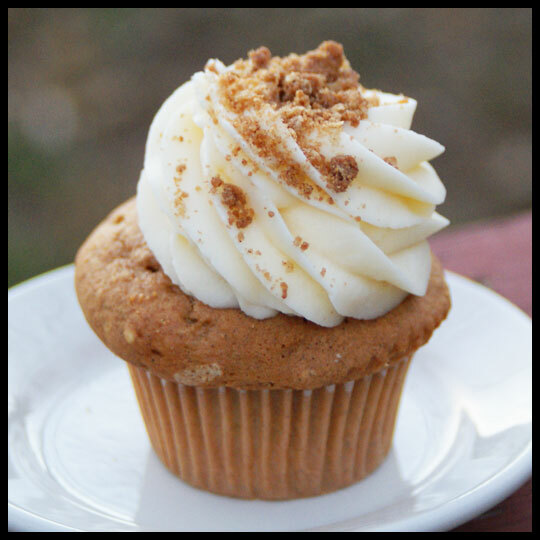 Kupcakes & Co.’s cream cheese frosting can be too sweet for me sometimes (not that it stops me), but the cinnamon from the cake and the crumble topping balanced it perfectly. While I was in there one day, the owner Michelle succumbed to Leah’s cuteness and gave her one of their reindeer cake pops. It was so well done that I had to snap photos before Leah devoured it. 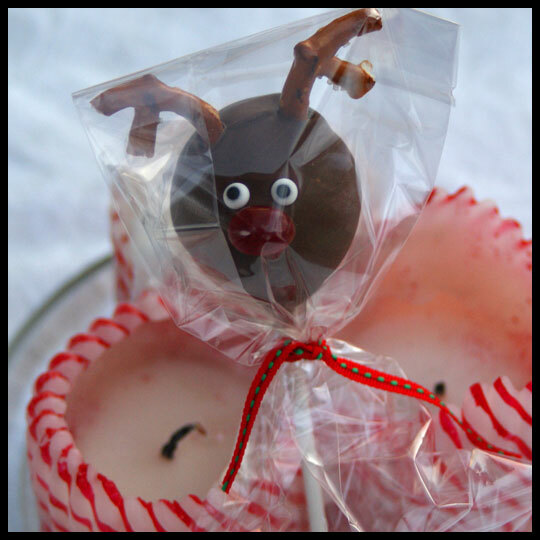 Kupcakes & Co. has added custom cake pops to their menu, so for each holiday you can stop in and find something creative and cute. They also had Santa hat cake pops, and now for Valentine’s Day, they have roses. Snickerdoodles has been added to the list of bakeries that are household names. My husband will randomly say (on the few cupcake-less nights we have), “I wish we had some Snickerdoodles.” I also now have my big sister hooked. The Sugar Cookie and Eggnog cupcakes were special holiday flavors, and they totally lived up to their name. The cake in the Sugar Cookie cupcake had actual bits of sugar cookie in it and everything about it really tasted like a sugar cookie. I was very surprised, having expected it to just taste like a vanilla cupcake. The Éclair and Nutella cupcakes are regulars that are rotated. Yes, that’s a mini éclair on top (like the mini cannoli on their Cannoli cupcake). The Éclair cupcake could have used more pastry filling for my taste, but I’m addicted to that stuff. The Nutella cupcake was lacking in hazelnut flavor, but was still a decadent, delightful treat. This cupcake was just as its title described, a winter wonderland treat! The vanilla cake had white chocolate chips and dried cranberries in it and was perfectly moist and not too dense, which can be hard to achieve when dried fruit is added to cake. The frosting was a delicious orange buttercream that paired well with the cake flavors. Honestly, I was a little skeptical about how “Winter Wonderland” this cupcake would taste, but there was something about the way the cranberry and orange flavors mixed with the vanilla cake and white chocolate chips that made the flavors come together and create a very wintertime/really good fruit cake flavor. 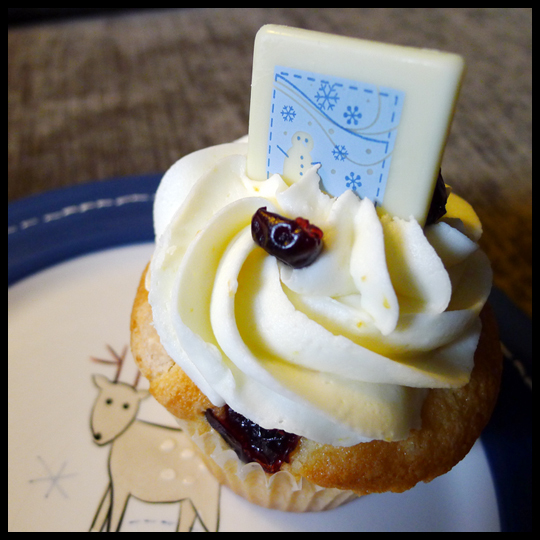 The adorable little white chocolate topper and dried cranberries were great decorations, and added to the wintertime feel. It was a really great cupcake for anyone who likes fruit flavors paired together and I hope to see it again next winter. We hope that you’ve consumed some great cupcakes this winter, like we have. If you haven’t, it’s still not too late to get out there and make us Crusaders proud! 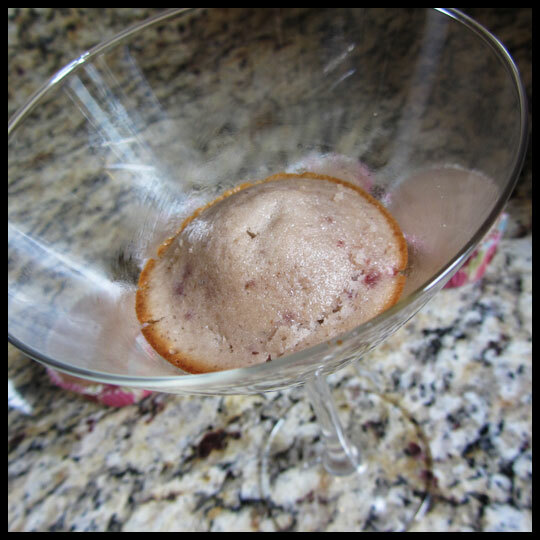 About a year ago, I saw this blog post about cupcakes baked in martini glasses and I knew I had to try it out. Well, it may have taken a year, but I finally did it! I knew I wanted a “booze” cupcake to go along with the theme and chose cosmo cupcakes. After searching through recipes I decided to stick with my comfort zone and modify a box mix and pre-made frosting. 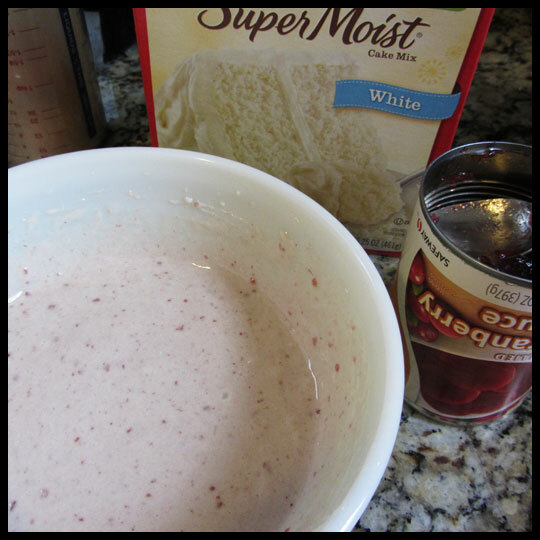 After finding this article on how to improve any box mix, I had a pretty good idea of what I wanted to do, but I was torn between 3 options: just add cranberry vodka, add cranberry vodka and canned cranberry jelly, or add the cranberry vodka with fresh cranberry puree? Final decision? Make all three and see which turns out the best. 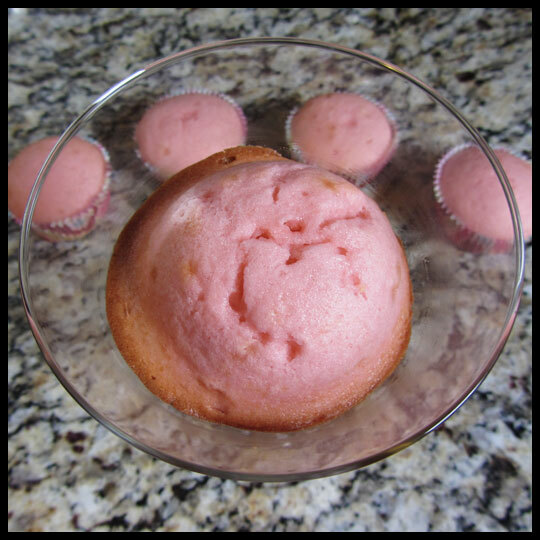 Now I’m sure you experienced bakers will already know which resulted in the best cupcake, but for the sake of the experiment and this post, I’m going to present and describe all three. For all three variations, I started with a Betty Crocker SuperMoist White Cake Mix. I knew that the white cake would allow for any coloring to show up with out getting muddied by a yellow cake. 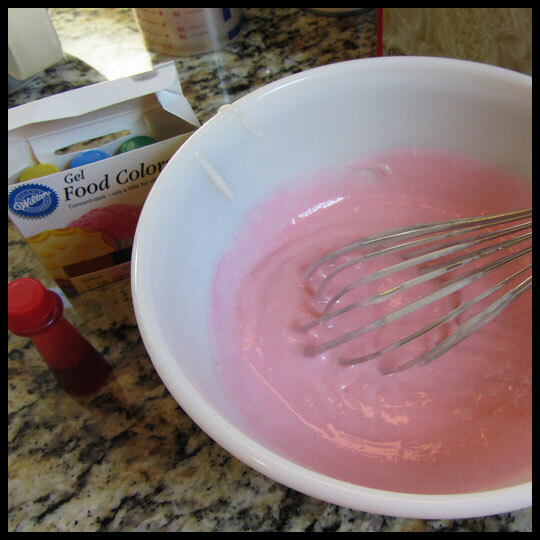 Since the vodka was clear, I decided to add some Wilton Gel Food Coloring to the batter to give it a more “cosmo-like” feel. The end result? It was REALLY pink!!! I wasn’t sure if I hated it or loved it, but either way I think this color would be a big hit at a bachelorette party or bridal shower. Now they just need to cool before frosting, so on to the next batch! I’m not really sure where the idea to used canned cranberry jelly came from. It may have been the lonely can sitting in my pantry, untouched, or it could be something I saw on tv. I’m not sure which it was, but I was really curious to see how it would turn out. I was pleasantly surprised buy the color of the batter. I thought these would turn out really well, but unfortunately, they came out more brown and lost any hint of red or pink that the batter contained. Learning from my prior mistake, for this batch I stuck with my standard scoop when adding batter to the martini glass. The directions said to bake for 10 minutes, but I still had to bake this for about 15 minutes. I don’t know if that was becuase of adding in the canned cranberry, if it was my oven, or a combination of the two. 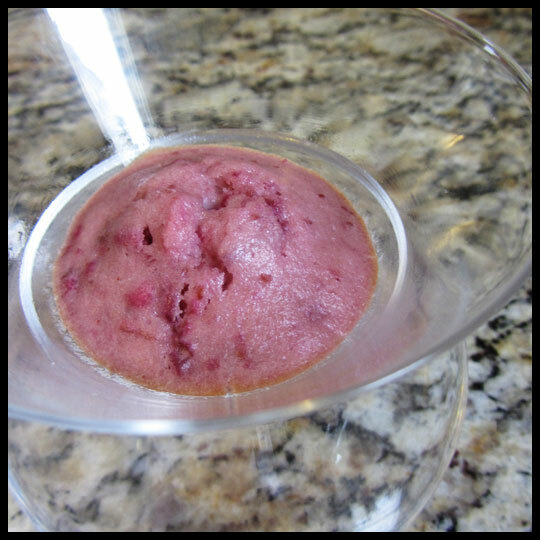 For this last experiment, I had to use frozen cranberries, but they were easy to thaw in the microwave and softened up nicely for the food processor. 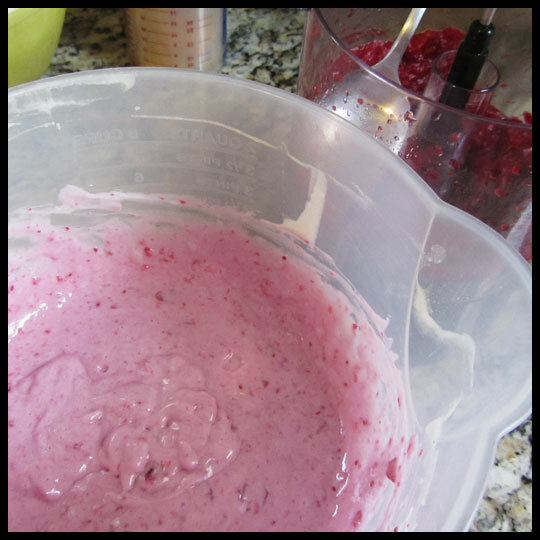 The result was a beautifully colored mash that, when added to the batter, created a nice bright cranberry color. How pretty is that color? I even have some of the puree leftover which I’m excited to put on top of ice cream! Once all the cupcakes had cooled, it was time to tackle the frosting. 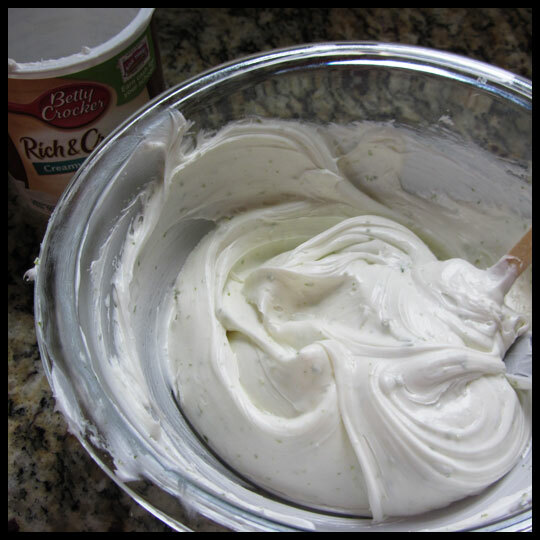 In retrospect, I really should have made a frosting from scratch, but I just wasn’t feeling it, so instead I started with Betty Crocker’s Rich and Creamy White pre-made frosting. I wasn’t sure what “white” would taste like, but already knew I would be adding lime zest and a little bit of lime juice so I wanted a plain base. Once everything was ready, it was time to frost the cupcakes and taste them! The cupcakes with the cranberry puree are by far the best. The cupcakes with just the vodka are blah. Not horrible, but not great. It tastes like a box mix. The ones with the canned cranberry lie somewhere in between. I should have gone with my gut instincts and made a frosting from scratch. This one ended up being way too sweet and tart. I think a vanilla frosting with lime added would have balance out the flavors better. 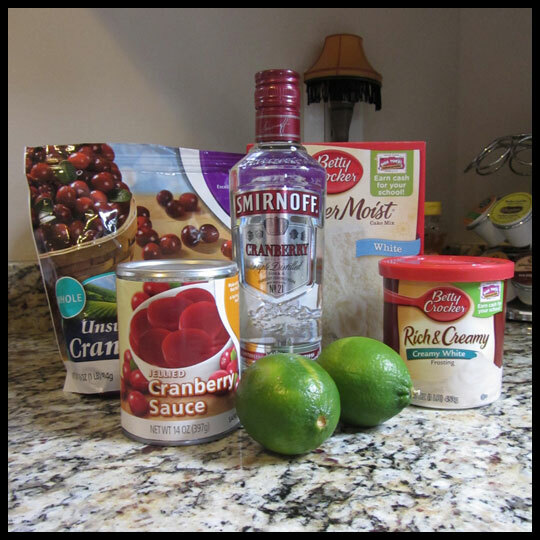 I think I will definitely make the cranberry cupcake with puree again, but this time focus on making a tasty lime frosting to go on top. 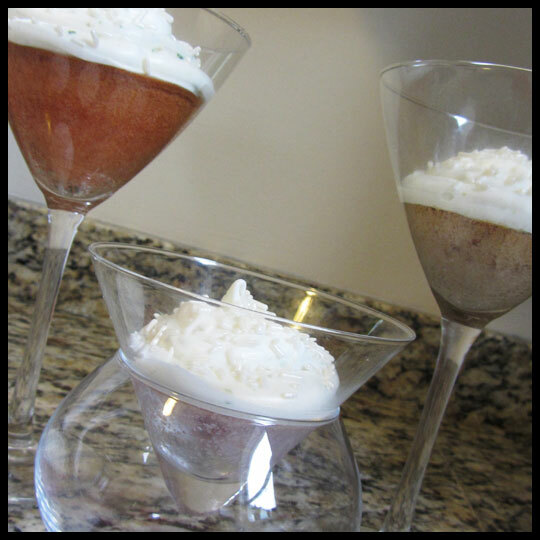 In the end, these martini glass cupcakes are adorable and can be made with any recipe you choose. How fun would they be to serve at a dinner party, or even have placed around a dessert table? I’m now interested to see what other non typical cookware or glassware can be used to bake in. Follow Us on Pinterest to join in the cupcake pinning fun!